GOP members were fuming. Republican Senator Bob Corker of the Foreign Relations Committee was incandescent; Senator Jeff Flake oozed regret and despondency. Both spoke with the freedom of those not seeking re-election, a chance, in other words, to ponder the direction of the US Republic. Ammunition for an unscripted show had been allocated, and there was no bigger target than the President of the United States, Donald J. Trump. Corker was feeling bruised in the wake of another Trump spray. The President had long been focusing on Corker’s role behind the Iran deal, calling his chairmanship of the Senate Foreign Relations Committee “incompetent”. This, despite Corker’s initially enthusiastic backing. Prior to the arrival of Trump on Capitol Hill, Corker got in a few sharp blows. The President, he explained to fellow members in the chamber, had tarnished the United States with “untruths”, “attempted-bullying”, and “name-calling”. Unfortunately, these criticisms rage at the nasty symptom, the cold rather than the corrupting dampness that caused it. Trump is less the virus than its outcome, a politically explosive culmination that took place in full view of a complicit US political establishment. That very establishment, to a large extent, is responsible for the tin foil quality of current political debate and mistrust. The reality show that is Trumpland came from the negligent production studio of GOP-Democratic governance. He feared the normalisation of that “regular and casual undermining of our democratic norms and ideals”, and the “daily sundering of our country”. There could be no meek acceptance of “the flagrant disregard for truth or decency, the reckless provocations, most often for the pettiest and most personal reasons”. Be careful, he claimed of “silence and inaction” and tolerating matters for fear that doing otherwise would “alienate the base”. There was the higher plane, the higher considerations of US institutions. Like Corker, Flake’s address supplies a lament on the decline of a state well and truly taking place before Trump crowned it with confounding ferocity and enthusiastic pettiness. If only these figures of sudden, spontaneous frankness had, donning their social commentator hats, spoken before. Within the GOP itself, approaches vary as to how to approach Flake’s notion of the anomalous. Speaker Paul Ryan is one for ignoring much of what comes out of the tweeting complex of the White House, using deft foot work in fending off the next crisis. Such a school of thought essentially sees Trump as titular, clownish, and containable. Let him rant, for no sensible person is listening. The GOP has become the party of indignation, nationalist confusion and patriotic perversion. The Democrats have duly supplied an alternative that is sullen, bankrupt, and disingenuous. While hard to swallow, the near genetic dysfunction of both parties, the corrosion of consensus, created the perfect cyclonic conditions for the current president. 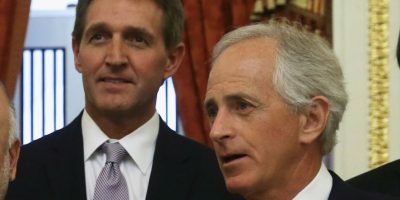 The outrage and dismay expressed by Flake and Corker is understandable on one basic level (the Republic in free fall, institutions sliding into the primeval swamp), but as with their Democratic colleagues, it ignores the why of Trump presidency, not to mention those who found him an acceptable alternative.